The ME-5 effects chain starts with the Compressor, which is the CS-3 Compression Sustainer pedal which Boss substituted for the earlier CS-2. The only real difference in the pedals, other than the appearance/colour, was that the CS-3 incorporated a tone control, which is also present on the ME-5. The ME-5 Compressor also differs from the pedals in that its parameters have to be tailored on slightly larger incremental steps. On the pedal variants, you simply turn a knob for infinite variation between the minimum and maximum, whereas the ME-5's effects have to be selected via a number of 'steps'. As with all settings in the ME-5, you are able to save favoured settings. 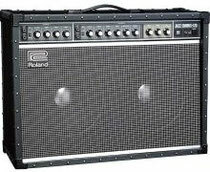 Any compressor which is in keeping with the Boss CS-2 or CS-3 is of course a laudable effect. The ME-5's Compressor pushes up well into the territory of country-style 'popping', but always operates musically - is brilliant at clean funk too. The Overdrive/Distortion is in fact three separate 'BOSS Pedals', and are all selectable via the buttons on the top panel. Each has a very different character. The first (No. 1, Overdrive) is subtle, ranging from basically clean up to obviously overdriven but never obscuring the character of the guitar. It does colour the clean sound with a 'Valvey'/Tube boost in the mids. However, use of the onboard EQ can reduce the extra mids effect to suit to match with your amp's characteristics. The second (No. 2, Overdrive) offers much greater saturation and can perhaps best be described as a '70s heavy rock' sound when pushed to its max. Is more of a distortion than an overdrive but it is a natural-sounding and versatile distortion. The third (No. 3, Distortion) offers a more raging drive. It's not a typical natural distortion - and is musical, but the envelope on attack is rather synthetic and there's a fizzy-ish top end which is best removed by taking down the treble a little on the Equalizer. It's definitely distortion rather than 'fuzz', but it has a character in the midrange which you can't really dial-out, but used it combination with other effects in the ME-5, this option can offer a wide range of unique tones. Next up is the Equalizer. Effectively, you are limited to bass/middle/treble control - with the middle serving just a single narrow band. However, you have to take into account that the ME-5's original RRP of was a heady £550 which amounts to well over £1,200 with inflation taken into account! Thus the BOSS ME-5 was not cheap on its introduction and so for the vast array of effects it offered plus the ability to incorporate MIDI, some areas were not feasible to expand upon. The Chorus and Flanger are compartmentalised as one, so you can only engage one or the other. Not that anyone I'm aware of would use both Chorus and Flanger. Both effects are lush and sparkly and when hearing the ME-5's sounds, it kind of highlights how far downhill these modulation effects have gone in the interim years. The ME-5's chorus offerings don't lose bass or top end - or end up sounding like it's gone through a practice amp! Control is again sufficient that with careful setting of the different parameters, you can get some extremely high quality sounds - and in <~STEREO~> by virtue of the ME-5's Stereo Bus! Needless to say, the Chorus effect built-into the ME-5 stole from this technology and is largely unrecognised as such - until NOW! The Flanger used without resonance and judiciously mixed with the original tone is spectacular. Used without careful thought, modulation effects can sound pretty dated, but the ME-5 offers enough settings options so that they genuinely do sound like the highest quality pedals you can lay your hands on. The Noise Gate is next in line, and is one of the most universally celebrated elements of the ME-5. There's just one parameter for the threshold, and the unit takes care of everything else. Set correctly, it cancels-out unwanted noise without the user really noticing it's there. The Reverbs are also excellent - you can choose the type of reverb from 'Room', 2x 'Hall', a 'Plate' and 'Gated' - the latter being a gated plate.